Pour 1/2 cup water & 1/4 cup white wine into a medium size cooking pot. Chop 2 shallots & 1/4 cup fresh dill. Mince a Tbsp fresh parsley. Place the shallots, dill, & parsley into the medium size cooking pot & bring to a boil. Once boiling, lower flame or temperature to low, to allow to simmer. Place the 1/2 pound of Salmon on the bed of simmering shallots, dill, parsley, water, & white wine. Place the Salmon on a plate, squeeze some fresh lemon over it, & serve with the roasted asparagus recipe below. Spray a baking pan with Nature’s Promise olive oil spray. Lightly & evenly coat the 1 pound of thin asparagus spears with a mixture of 1/4 cup olive oil, 2 Tbsp minced garlic, 1 Tbsp minced parsley, & a pinch of Old Bay seasoning. Sprinkle 2 Tbsp freshly grated Parmesan over asparagus, & serve with the Poached Salmon recipe above. Portions: Women: 3 oz. 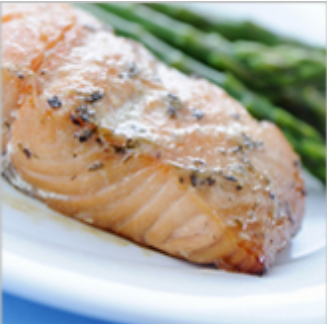 Salmon filet & 1 cup asparagus/ Men: 6 oz. Salmon filet & 1 cup asparagus. To have this recipe as a Meal 2 or 3 on the Remedy Recipes format, simply add a carbohydrate such as brown rice. If it is to be used for Meal 4, you may add a side salad. The “Shallow Poaching” technique really captures the flavors of the herbs that it is poached with. The Salmon cooks perfectly, and is truly delicious. Another great thing about poaching the fish, is that it does not have a fishy aroma when cooking. It’s a great recipe as we begin Lent, and can be applied to any filet. We hope that you enjoy it.